Ed Miliband has resigned as leader of the Labour Party saying he takes "absolute and total responsibility" for the party's defeat. Mr Miliband held on to his Doncaster North seat, but quit after a dramatic election night where his party was virtually wiped out in Scotland and David Cameron was on the way to a Commons majority. This is not the speech I wanted to give today. Earlier today I rang David Cameron and congratulated him. I take absolute and total responsibility for the result and out defeat at this election. Britain needs a strong Labour party and now it's time for someone else to take forward the leadership. So I am tendering my resignation. He told them he was looking forward to spending more time with his family and he thanked the British people for their involvement in his campaign. "Thank you for the selfies, thank you for the support," he said. "And thank you for the most unlikely cult of the 21st century - Milifandom." Former Shadow Chancellor, Ed Balls, refused to answer questions or speak to the media after losing his Morley and Outwood seat. The former Deputy Prime Minister Nick Clegg is to make a statement about his position after election results that saw the Liberal Democrat representation in the House of Commons slashed. Cabinet ministers Danny Alexander, Vince Cable and Ed Davey lost their seats in what looks likely to be the worst election result ever for the party. Labour sources have confirmed to ITV News that Ed Miliband is preparing his resignation speech. The Labour leader was widely tipped to quit after his party failed to return enough MPs to form a government. Nick Clegg has said it has been a "cruel and punishing" night for the Liberal Democrats, as he hinted that he was considering his future as party leader. "It is now painfully clear, that this has been a cruel and punishing night for the Liberal Democrats," Clegg said after holding onto his seat. "The election has profound implications for the country. It also has profound implications for the Liberal Democrats. "And I will be seeking to make further remarks about the implications of this election both for the country and for the party that I lead and for my position in the Liberal Democrats when I make remarks to my colleagues in the Liberal Democrats later this morning when I return to Westminster." 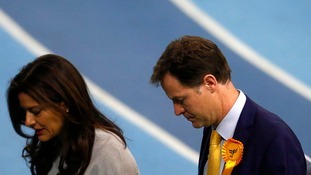 ITV News' Tom Bradby said Mr Clegg's speech sounded like it was a "resignation speech". Ed Miliband should consider his future as Labour leader after a "depressing" performance at the general election, ex-foregn secretary Jack Straw has suggested. Asked if Mr Miliband would have to resign, he told Sky News: "It is for Mr Miliband to make up his mind about his future." Mr Straw said the party faced "a desperate situation in Scotland and a pretty depressing situation in England and Wales" as David Cameron appeared on the verge of remaining in Number 10. He added: "My advice to everybody, particularly against what is depressing news, is to take a deep breath, to go to bed and then spend two or three days assessing where we go next." Former Labour spin doctor Damien McBride has told ITV News the party must look for "clean skins" like Chuka Umunna and Gloria De Piero when choosing the successor to Ed Miliband. Mr McBride explained why Mr Miliband's attempts to distance himself from the Blair and Brown era proved unsuccessful.